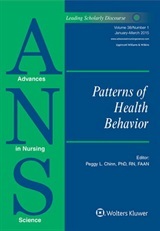 Patterns of health behavior, the topic of this issue of ANS, are at the heart of nursing’s concern. In this issue you will find thought-provoking articles that address specific health behaviors that constitute human responses to health challenges. 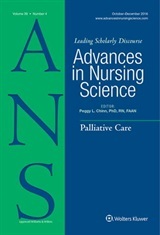 Several of these articles provide insights that expand understanding of human responses, and evidence that inform nursing practice. Watch the ANS web site and blog over the coming weeks as we feature each of these articles, with messages from the authors about their work. Visit the ANS web site now! Here is what you will find in this new issue!